Take a look at this amazing looking CMS system. This is how things should look and feel. 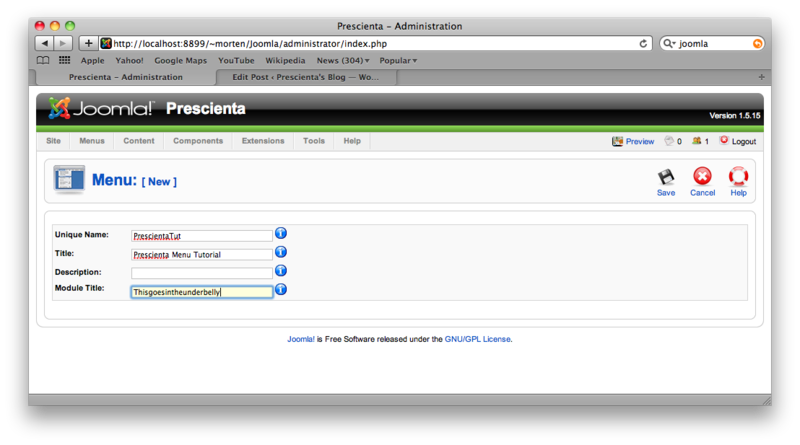 When the page is served, the Joomla engine will use the magic of PHP to replace the tag with “something” from the CMS. From the sample it appears evident that Joomla will pump out the “module” named “top”. Where do we find “top”? Open up the file called templateDetails.xml, and locate the “positions” node. Inside that node, you will see <position>top</position> this tells Joomla that we have “something” that we’d like to associate with a position called “top” for this template. Let’s experiment with a new “position”. We open the templateDetail.xml and add another position node. Let’s call it “underbelly”, once you are done, save the file and go to the Joomla admin. 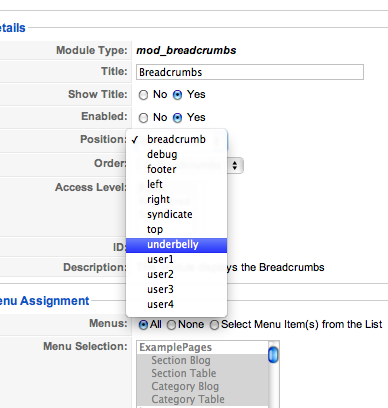 Locate the Extensions / Module Manager, and pick Breadcrumbs (for example). The configuration for the breadcrumbs will appear and if you pick the “Position” drop down, you will see your newly created position in there. Don’t make any changes, instead go make a new menu. Simply go to the menu manager and create a new menu, fill it in like so – pay attention to the module name, since we will need that later. Once you have created your menu, add some items to it. I don’t really care what you put in, anything goes. The next step is to associate the menu (which is a module) with the position. This is done via the module manager that we touched upon previously. This should be fairly simple. You may recall that the module name of the menu was “thisgoesintheunderbelly”, so we pick that. In the configuration page, we select the “underbelly” position. So far so good, but where will the underbelly go on the frontend? 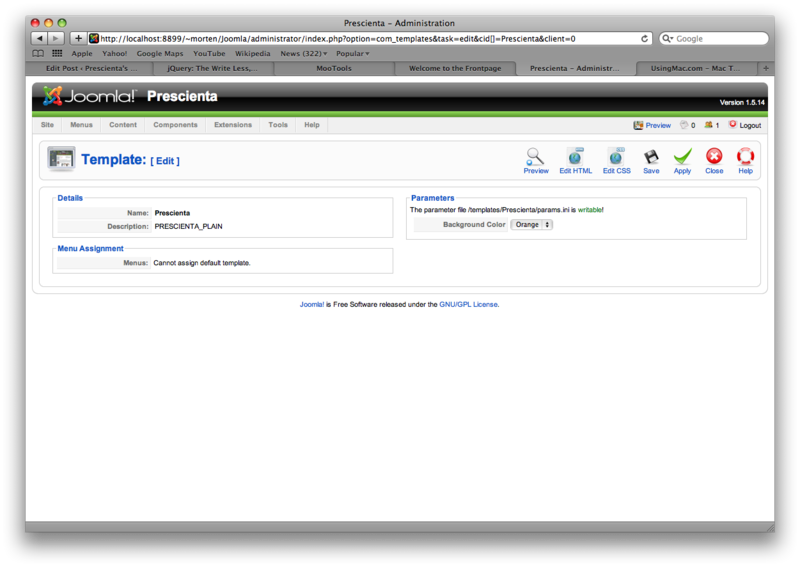 Installing Joomla is well documented, and surprisingly easy to install (at least on my good old macbook pro). 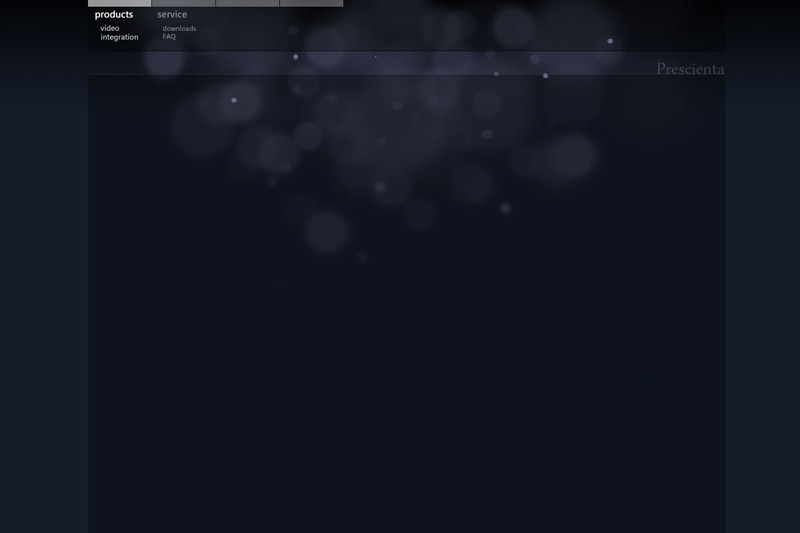 Once installed, I think most people are wondering how on earth do I create a theme. I sure did, so i dug around and started picking a theme apart to figure out how to do this. “Installing” a new theme is as simple as copying an existing theme to another folder. I shamelessly started with… well.. now I forgot, but never mind. Pick an existing template, copy the entire folder and name it “Prescienta” (that’s what I did). Locate the index.php file, and make a copy of it too (let’s call it _index.php since underscores make you seem clever! If you go to the management console, and pick Extensions/Template Manager, you’ll see two templates with the SAME NAME (aaargh). The devil is in the details as they say, so lets go back to the template dir, and find the file called “templateDetails.xml”. In that file you will find a bunch of things that you can edit. Some of them are pretty obvious (like the name of the template, the author and so on), but others offer some nifty functionality. Let’s add a new parameter to control the background color. If you save the files, go back to the template manager, and pick your new template, you will see the new option that you just added. Fantastic, but how do I use this? If you go back to your index.php and open it in your favorite editor (I use Coda), you can add the following code. 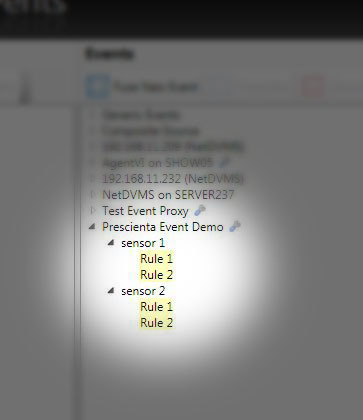 At times you want to send events to an Ocularis server, and use the servers event distribution system to send notifications to operators and clients. This is – fortunately – a pretty simple operation, so let’s look at a sample. 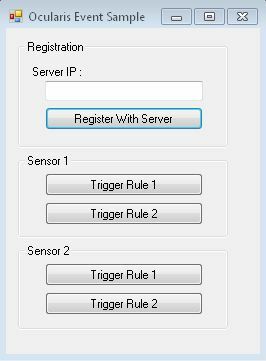 We are going to create a small WinForm app that simulates two sensors with two rules each, without further ado, lets start by creating a simple WinForm app. 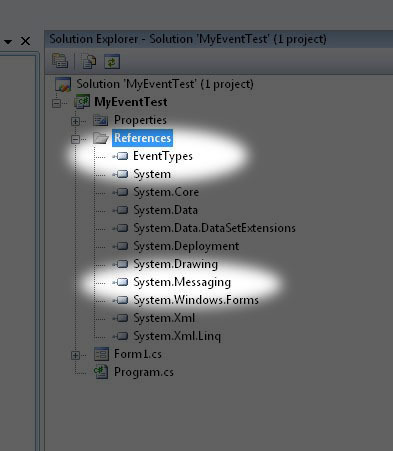 Then, add references to System.Messaging and EventTypes.dll (part of the Ocularis SDK). System.Messaging enables .NET to use Microsoft Message Queuing, while EventTypes provides the classes of object we will be sending to the Ocularis Server. Ocularis is using Microsoft Message Queue which provides a safe and reliable store- and forward mechanism. That means that even if the server is down, or unreachable, events will be sent when it comes back up. No additional code is necessary, but naturally the events will arrive with a delay if the server is unreachable for some period of time – but at least you will eventually be notified. 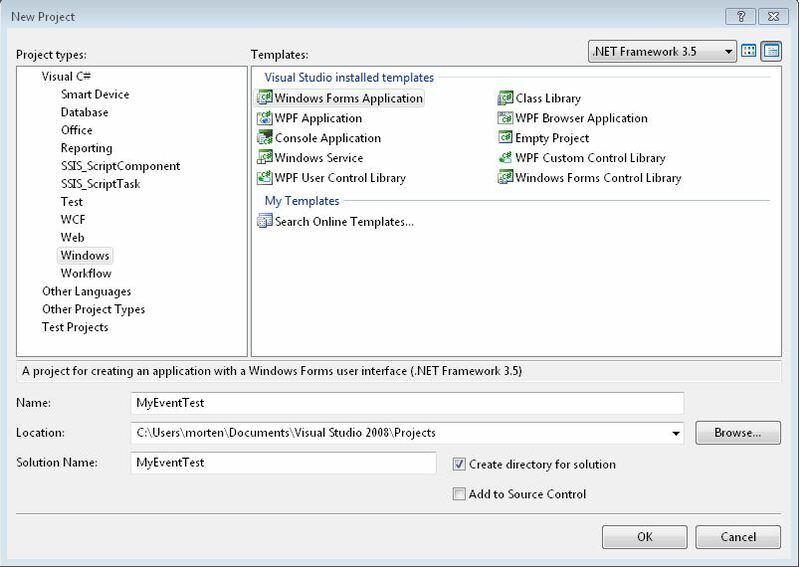 The GUIDs are created using Visual Studios GUIDGEN tool (Tools/Create GUID). In the handler for [Register With Server] we need to create the code to register at the Ocularis Server. To do this we need to create an XML fragment that describes the system (this is just a string with some XML in it), wrap the fragment in an object and send it across using the Message Queue. Now let us register at the server. In the application, the server input field is mapped to _ctrlServerIP (a textbox), so we proceed with this..
That’s it. If it all went well, we should see the source in the admin, with the two sensors and the rules attached. To trigger an event, we simply create another object and send it across the server queue.